In this month’s Sephora monthly must-haves, we’re looking into products to help us streamline our summer routine. As stated in last week’s post, we want to spend as little time away from our lounge chair as possible – and these products will help us do just that! – Nirvana Black Body Oil is the BFF to your Elizabeth and James Nirvana Black perfume you bought during a previous Monthly Must-haves. Enriched with argan, soybean, and moringa oils to replenish the skin leaving it soft and supple with the signature musky scent of Nirvana Black, this will be the only fragrance we’re caught wearing all summer. – New products from GLAMGLOW are always intriguing as we’ve documented our love of their overnight mask already. The GLAMGLOW Flashmud Brightening Treatment uses crazy technology like WhiteEnergy, Flashlucent, and Reflectrum (those can’t be real science terms) to deliver soft, glowing skin. This could also work as a (pricey) face wash if you’re on vacation and happened to forget to bring one. – This Formula X The Power Couples Four Mani/Pedi Duos seems like the perfect travel companion this summer. Where the expertly matched shades as they’re intended, or mix and match to create your own unique combo! We especially love Alive & Temptation together, but are also excited to see that it comes with Formula X’s own nail cleanser, base coat, and top coat. all of which we’ve been meaning to try out. – Tony Moly Bbo Bbo Lip Balm is a new (to us) product and brand, but one we can already appreciate for the fun packaging and accessible prices. This $9 lip balm is not only the cutest looking lip balm we’ve ever seen, but also infused with Vitamin E and honey or blueberry extracts (you choose) for kissable lips (Bbo Bbo even means ‘kiss’ in Korea!). – Ever on the search for the best beachy waves, we’re eager to try this new product from Bumble and Bumble. If you like the original Surf Spray, but find it leaves your hair a bit too dry after applying it, this may be the solution! 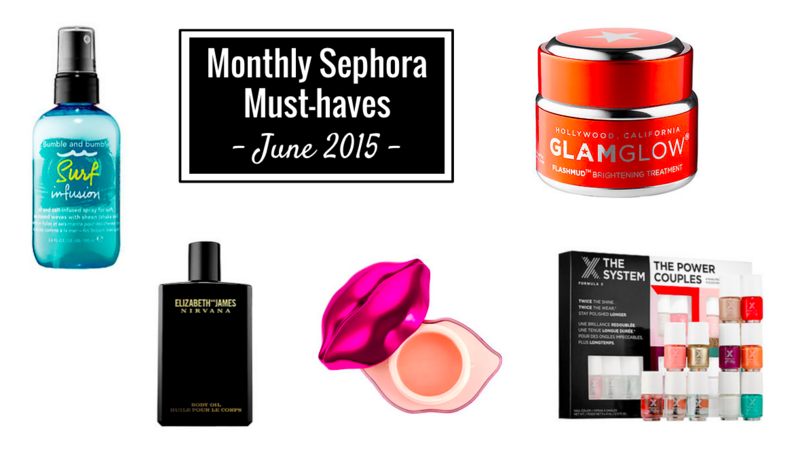 What are you loving from Sephora this month?